The main pumping chamber of the heart is on the bottom left side of the heart, it is called the left ventricle. Blood flow through the left side of the heart is simple. It goes from the top chamber of the heart called the left atrium, to the bottom chamber of the heart, the left ventricle, then out to the body. The mitral valve, one of the four main heart valves, is the valve between the top and bottom chambers. The mitral valve’s role is to stop blood from leaking backwards. Look at the pictures below, if the mitral valve were not there, then every time the bottom chamber squeezed to pump blood out to the body, there would be nothing to stop all the blood going back into the top chamber rather than to the body where is it needed! Mitral valve prolapse (MVP) is a condition where the mitral valve – which is supposed to be firm – becomes diseased and floppy. The technical term for this is “myxomatous degeneration”, but most people refer to it as mitral valve prolapse or floppy mitral valve disease. See the difference between the valves below. Remember, the mitral valve is there to stop blood flowing backwards into the top chamber when the bottom chamber of the heart pumps blood out to the body. For this reason, the mitral valve normally has tough, leather-like consistency; however, in mitral valve prolapse it becomes soft and spongy. Unfortunately, due to the diseased sponge-like consistency of the diseased mitral valve, it’s unable to handle the normal stresses generated by the squeezing of the bottom chamber. As a result, it gets pushed up or lets say “prolapsed” into the top chamber. Here you can see the mitral valve in a normal functioning heart. The red arrow points directly at the mitral valve. The valve has well-defined structure, allowing it to completely open and close. 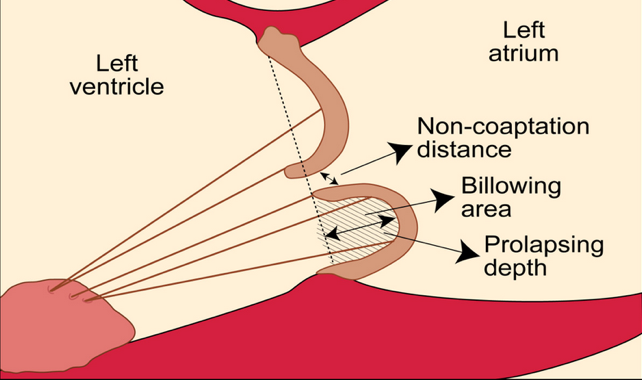 This image, which zooms in on the mitral valve, shows the floppy, sponge-like characteristics associated with mitral valve prolapse. When initially described as a relatively common cause of mitral valve disease in the 1950’s, mitral valve prolapse was known as ‘floppy valve syndrome.’ The underlying process making the valve floppy is technically termed ‘myxomatous degeneration,’ which literally means jelly-like transformation. The valve is known as a myxomatous mitral valve. Look at the pictures below, these are echocardiograms, see the difference between the normal valve and the myxomatous mitral valve with advanced degeneration. The normal valve is thin and firm, whereas the myxomatous valve of mitral valve prolapse is thickened and degenerated which in advanced cases, compromises its ability to act as a valve leading to a leaky mitral valve. If you look closely you can see where the valve is supposed to close, it actually allows the blood to leak back – hence the name “leaky heart valve”. Mitral valve prolapse used to be over diagnosed. Read this article for an in-depth explanation of why this was the case. Using the current criteria for the diagnosis of mitral valve prolapse, it is estimated that between 0.6% – 2% of the population are affected. So far we have described what the valve looks like as a result of the process of “myxomatous degeneration”. But, what exactly is happening in this process and how do we cure it? Although we don’t have the definitive answer yet, studies performed over the years have given us a pretty good idea of what’s going on. I’ll explain some of it without getting too technical. The valve is mainly made up of connective tissue; similar to a joint that holds bones together. Just like a joint of someone that is double-jointed, the valve is over-stretched the heart squeezes. Collagen is the main component of connective tissues and gives these tissues strength. Normal mitral valves generally contain type-I collagen, such as that found in tendons that hold muscles to bones. Myxomatous mitral valves are found to have more type-III collagen, which is found in weaker more stretchy tissues and known to have less strength. Myxomatous mitral valves also have infiltration of the valve by substances called ‘proteoglycans’ that disrupt the normal support of the leaflet. Mitral valve prolapse valves are stretchier and only half as strong as normal valve tissue. Also, the chords that attach the MVP valves to the heart wall are only half as strong as normal. This may help to explain why rupture of those chords is the main cause of worsening of valve failure and often an indication for needing surgery in patients with severe valve prolapse. A few studies have tried to look into whether there is a genetic cause of MVP. Although there is a suggestion that a certain proportion of individuals have a hereditary component, much further research is needed to identify potential genetic causes. If you have MVP, you can’t blame your mother and father just yet! Heart Sounds. Mitral valve prolapse was historically picked up through heart sounds on physical examination. It is associated with a click, and possibly a murmur. Hence, it was once called click-murmur syndrome! The murmur is representative of leakiness through the mitral valve known as mitral regurgitation. Echocardiogram. The standard test for diagnosing mitral valve prolapse is transthoracic echocardiography (on the chest wall), which is an ultrasound scan of the heart. The mitral valve leaflets are typically thickened in mitral valve prolapse, a sign of degeneration. However to establish a diagnosis of mitral valve prolapse the mitral valve leaflets need to be seen to prolapse back into the top chamber of the heart by at least 2mm. An example of mitral valve prolapse being viewed from what’s referred to as a “long axis view” on an echocardiogram. Transesophageal Echocardiogram. This is where a small ultrasound probe is passed into the food pipe (oesophagus) and allows very clear pictures of the heart. This is somewhat of an invasive procedure; therefore, is not routinely performed. In cases where there severe prolapse and a leaky valve exist, this may allow greater characterization of the disease and help in surgical planning. 3-dimensional Echocardiography. This can be done with both the transthoracic and the transesophageal echocardiograms. The 3-dimensional picture can be used to provide much greater detail about the valve itself. This may be particularly useful in those undergoing surgery for severe mitral valve prolapse with a leaky mitral valve. EKG. The EKG heart tracing isn’t generally very useful in diagnosing mitral valve prolapse. It may find arrhythmias in those undergoing monitoring for palpitations. In patients with a leaky mitral valve, it may provide clues regarding the enlargement of the heart chambers. MRI Scan. MRI scanning is not typically used to diagnose mitral valve prolapse however in cases of a leaky valve, it may be used to accurately assess heart enlargement and heart muscle pumping function. Mitral valve prolapse with a severely leaky heart valve may lead to symptoms such as fatigue, irregular heartbeat, shortness of breath and swelling. These are symptoms of congestive heart failure. The majority of those with mitral valve prolapse will never experience complications. For patients with mitral valve prolapse and a leaky valve, if the leak is severe in nature then surgery is required. If the heart shows sign of muscle dysfunction then there is a chance for irreversible damage, so it’s important to be followed by a specialist so surgery can be done at the correct time. Patients with a moderate to severe leaky heart valve may be at increased risk of complications that include the development of pulmonary hypertension (increased pressures in the lung arteries) and atrial fibrillation (irregular heart rhythm). There is a tiny increase in the probability of developing an infection of the mitral valve. If you have MVP and your physician decided not to give you antibiotics, be reassured that he/she is acting within current guideline recommendations. If your physician does prescribe antibiotics then they should know why they are doing so and have their reasons. They consider you to be at high risk and you should certainly discuss this with them. Some patients with mitral valve prolapse may develop heart arrhythmias although they are typically not serious. Simple monitoring can help in reassuring patients and diagnosing the palpitations. Mitral valve prolapse syndrome is the combination of a prolapsing mitral valve, and a variety of symptoms that include dizziness, palpitations, fatigue, brain fog, chest pains, shortness of breath and others. Unfortunately in the 70’s and 80’s many people that were diagnosed with this syndrome had symptoms, but they didn’t have a prolapsing mitral valve. When the correct criteria for mitral valve prolapse were applied it was found that the number of people with mitral valve prolapse was dramatically lower than thought. This was frustrating for those that had symptoms that they attributed to mitral valve prolapse. Many patients with similar symptoms were found to actually have a diagnosis of dysautonomia. There are of course patients with these symptoms and a prolapsing mitral valve. However, it’s never been proven that the valve is the cause. It is felt the problem is likely to be due to the body’s nervous system known as the autonomic nervous system. The best way to develop a medicine to treat the disease is to understand exactly what’s happening, down to most basic of cell details, then target therapy towards those processes. For example, if mitral valve prolapse was down to a virus, and we knew which one, we could direct an anti-viral treatment towards it. When it comes to developing medicines to prevent degeneration of the mitral valve; however, we have a huge problem in that we know something is wrong, but we don’t know exactly what it is! The unfortunate truth is that we don’t really appear to be close to a therapy to stop the valve itself degenerating at the moment. However, we are getting closer to identifying medicines that may prevent the heart from failing in the case of a severely leaky valve. Research has shown that beta-blocker therapy may be useful to this effect although more trials are needed to confirm that. Despite this, a recent survey of cardiologists in showed that although there is no evidence for most medicines in mitral valve prolapse with a leaky valve, there is a wide variation in medicines prescribed for this. It is advised that blood pressure is treated as usual. Most people with mitral valve prolapse will never notice it. These patients do not need treatment. But in some patients, the valve will degenerate and lead to a leaky mitral valve. Those with a mild or moderately leaky valve will typically undergo surveillance and not specifically need treatment unless the disease state worsens. Those with more severely leaky valves will typically need to undergo mitral valve surgery or a procedure in order to prevent the heart from being irreversibly damaged such as a MitraClip. Read here for a detailed overview of mitral regurgitation. The diagnosis of mitral valve prolapse itself does not require any specific follow up. Associated symptoms such as heart palpitations and chest pains may require follow-up if recommended by a cardiologist. Can Mitral Valve Prolapse Kill you? Can Medicines Help Your Mitral Valve? Do You Need Antibiotics For Dental Work With Mitral Valve Prolapse? 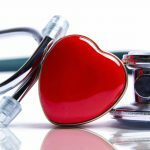 How Common Is Mitral Valve Prolapse Really? Why Are So Many People Dismissive of a Diagnosis of Mitral Valve Prolapse?